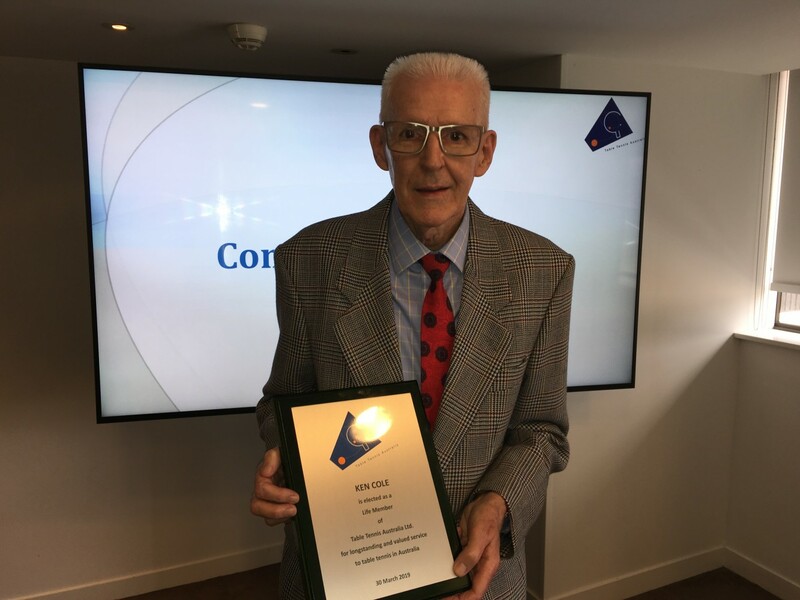 TTA is pleased to announce that Mr. Ken Cole has been awarded Life Membership of TTA for longstanding and valued service to table tennis in Australia. Ken’s nomination for TTA Life Membership was unanimously supported by the State and Territory Associations at the TTA AGM on Saturday 30 March 2019. Ken started his table tennis career in the early 1950’s. He was part of numerous NSW junior teams that won National titles and was an accomplished senior player in NSW. Ken also enjoyed a distinguished career as a veterans player, captaining NSW for 31 years, winning no less than 14 National Titles across three age groups as part of NSW teams, and 4 winning doubles/mixed doubles National Titles across two age groups. Ken also won a bronze medal at the 2004 World Veterans Championships in Over 60 Men’s Doubles. However, it was as an administrator where Ken made his biggest contribution to table tennis. Over 20 years Ken held multiple positions within Table Tennis NSW including Assistant Honorary Secretary, Vice President, President, Team Manager, Senior and Junior Selector, and Delegate. Then in 1984, when the National Veterans Championships were held for the first time, Ken emerged as arguably the most significant contributor to veterans table tennis in Australia. Ken is widely regarded as the doyen of Australian veterans table tennis, to the extent that the winner of the National Veterans Player of the Year Award receives the Ken Cole Trophy – the highest honour that can be bestowed upon a Veterans player in Australia. Ken served for 21 continuous years on the National Veterans Committee, including 17 years as Chairman. Ken was also pivotal in establishing the annual Australia-New Zealand Veterans Test Match, with the event being so successful that a reciprocal rights agreement between TTA and TTNZ has been established and covers all National Championships. Ken's contribution to table tennis in Australia, particularly to veterans table tennis, has been overwhelming. Congratulations Ken, you’re a worthy recipient of TTA Life Membership. To view Ken’s full bio, please click here.